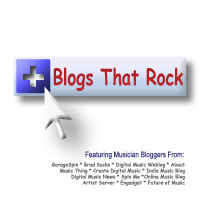 Sixteen great songs by sixteen great bloggers. I thought it would be interesting to gather several bloggers that normally write about music and/or technology to actually collaborate and produce an album of independent, record label-less, DRM-free, creative commons covered music, and to raise money for charity while doing it. Hey, it worked. More info below the track list. Play or download anything you want. It's free. If you decide to buy the album, $3 from your purchase will be donated to charity. By Mike B, editor of GarageSpin, and sole member of basement band, DreamSpin. The CD includes album art, artist info, and an audio CD, all shrink-wrapped in an oh-so-shiny jewel case. The full album download includes DRM-free mp3s of every song above, plus .JPG files of the album artwork. PhotoShop rocks. $3 from every sale of Blogs That Rock at the store, (whether CD or full album download), will be donated to the Christian Children's Fund. CCF creates programs to alleviate child poverty, vulnerability and deprivation throughout the world. More info here. If you'd like to be the first to know about new music or big announcements, you might want to sign up for the "new music" mailing list (in the right column). Don't worry, you will not be spammed, or even receive very much email, honestly. GarageSpin, my blog, follows indie music and indie promotion technology. DreamSpin is my garage-PC band. Learn more here.